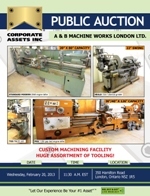 Corporate Assets Inc. | A & B Machine Works London Ltd. - Corporate Assets Inc. CUSTOM MACHINING FACILITY FEATURING: TOS CNC vertical turret milling machine, LEGNANO T-350 44"x120" gap bed engine lathe, (3) OKUMA LS engine lathes, STANDARD MODERN engine lathe, MISAL K14 engine lathe, LEINEN precision tool room lathe, EXCELLO vertical turret milling machine, TOS vertical turret milling machine, BROWN&SHARPE universal cylindrical grinder, BROWN&SHARPE hydraulic surface grinder, JAKOBSEN, hydraulic surface grinder, NORTON universal grinder, SUNNEN bench type precision honing machine, (2) BARBER COLMAN gear hobbers with full complement of tooling, BUTLER 6" vertical slotter, LINDE TIG welders, HOBART MIG welders, (2) 3 ton cap freestanding jib arms, 75' freestanding overhead gantry system with (2) 1 ton bridges with hoists. Also large qty of perishable tooling, (2) MILWAUKEE mag base drills, large qty of power and pneumatic tools, air compressors, large qty of raw material, stainless steel, tool steel and bronze stock, inspection equipment and much more.